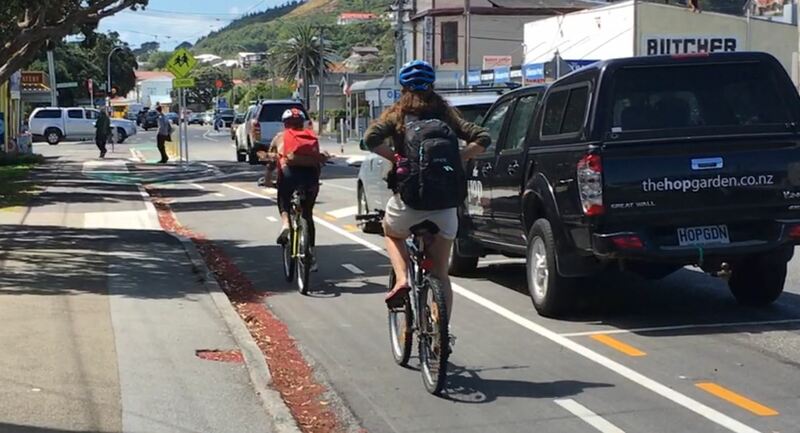 The Island Bay Cycleway’s influence on Wellington transport thinking, and public discourse, is really significant. (It helped give birth to Talk Wellington!) In an issue space that’s been rife with reckons, civic activation, politicising, good intentions, cockups and conspiracies, it’s an otter relief to know it’s really coming right. This post originally appeared on Island Bay Cycleway and is reproduced with thanks. NB: Talk Wellington bears all responsibility for otter puns. Wellington City Council have made a major announcement regarding the planned upgrade of The Parade in Island Bay. The good news is that it is now proposed that NZTA will fund 75% of the cost of the upgrade by including it in an integrated plan for high-quality biking and walking connections from the south coast to the city. Mayor Justin Lester says “with the new government’s policy statement on transport, we have the opportunity to make more improvements in more suburbs with the same amount of ratepayer funding [approximately $8 million]. By partnering with NZTA under the new Government Policy Statement, we have the opportunity to fund up to $32 million worth of changes in these areas by 2021, with the Council paying 25 percent and NZTA paying 75 percent”. $32 million is a massive investment into improving transport options in the southern suburbs. The bad news is that it will mean a further delay of a year before any work starts on The Parade because the upgrade becomes dependent on the Newtown Connections project. However, Wellington City Council are proposing to do remedial work in the meantime which will include removing all the ghost markings and resurfacing the section of The Parade between Dee St and Tamar St. Although it’s disappointing to be facing yet more delay before the upgrade begins it’s really hard to see how the city council could possibly turn down the possibility of such a substantial offer of funding from NZTA. In fact, it would be financially irresponsible not to integrate the two projects. It’s also great to see NZTA finally recognising the Island Bay Cycleway as being part of a bigger network picture. Props to the current government for creating the policy settings for that to happen. In related news in November Wellington City Council will also be be seeking community feedback on packages of options involving different routes and changes to streets in Newtown, Berhampore and Mt Cook. Read more about that here. Talk Wellington related posts: starting with good korero to make streets better and signs of good progress .